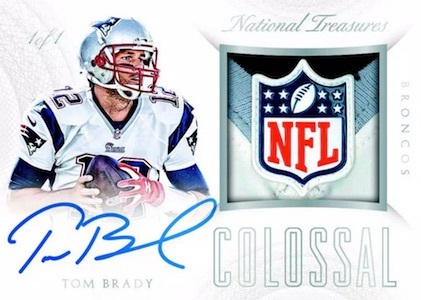 A familiar high-end sight for collectors, 2015 Panini National Treasures Football is back with the same basic format that made it the star of the hobby years ago. Each hobby box of the pricey product promises three autographs and three relic cards. While the base set is hardly the focus of a product like this, collectors will find two of these cards per box, including one parallel. Among the crowd favorites, NT RPA (Rookie Patch Autographs) cover the top 2015 rookies with on-card signatures, a print run of 99, and Tag, Brand Logo and NFL Shield parallels. Geared to the more iconic franchises, America's Team (Dallas Cowboys) and Steel Curtain (Pittsburgh Steelers) inserts showcase autographs and relics for key names..
Pairing a signature and inscription, Notable Nicknames and Personalized Treasures are each numbered to 25 or less. Multiple booklets add another element with options such as the quad-fold Treasure Chest cards that feature either 12 autographs or 24 relics. 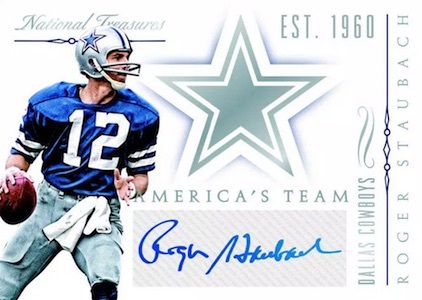 There are also Draft Treasures Signature Booklet cards which are numbered to 25 and offer Prime (#/10), Brand Logos (#/2), and one-of-one Laundry Tags and NFL Shields. Other memorabilia inserts include Brand Logo, Colossal Materials, Leather & Lace, Nameplates, NFL Shields, NFL Shields Dual and NFL Captain’s Patch. Please note that the following cards are mock-ups and not final cards. Designs and contents are subject to change. RASHAD GREENE 2015 NATIONAL TREASURES ROOKIE COLOSSAL AUTO NIKE TAG " 5 5 "
Not all subjects found in each parallel. View the full spreadsheet for specific print runs. 16 cards. Serial numbered #/49. 31 cards. Serial numbered #/6. I know these cards are mock ups.But check out who Bradys team is. Supersitz � Yup. I saw that as well. Maybe they know something we don’t and Brady is replacing Manning next season in Denver. Unfortunately, not all that uncommon with Panini solicitation material. Having said they, they almost always catch the error before the actual printing. If ODB Jr has autos in this and they are live i’m gonna be a little pissed.I have a redemption of his from last years NT.That would not make any sense at all.But what does one do.They don’t listen to consumers. Supersitz � I agree that it is very frustrating to have an outstanding redemption and see the player in question appear in a later release with live autographs. Hopefully those 2014 NT cards for Beckham get issued soon. Mike hanson � Rookies are heavily featured and always a popular target. Steelers and Cowboys have their own specific inserts and they are already favorites in the hobby. NT usually has a good mix of vets, retired players and rookies so it really just depends on what you collect. Just broke a few cases of this with Layton Sports Cards group breaks. Really great product. 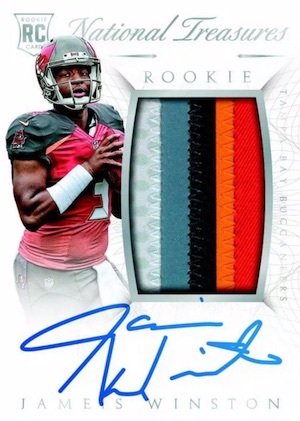 Big names and sweet patches make this a top product for the 2015 NFL rookie class. Many veterans in this product as well. We pulled 1/1 printing plate patch auto Jim Kelly. My personal hit was David Johnson Vertical Variations Booklet /99 redemption. Good news about the redemptions in this product though is that many of them are already live and ready to ship out from panini so you won’t have to wait too long before you have the card in hand. 5 stars. Been in well over 20 cases breaks. The cards for the most part look great. This is not a product to buy a case/box of, but as a break its not thar bad. Low risk high reward. There seem to be a lot of boxes that were packaged the same exact cards. I saw two different boxes that had a coates rpa, harrison auto, and big ben auto. I saw it with the Bengals and Lions this was. Vet autos are almost every box. Some great and some not worth the cardboard they are on. The patches this year look great although they could do without thr single color jerseys. I saw several 1/1 single color jerseys which should never be the case. Redemptions are running 3-4 per case on average and are generally a high end rookie. The book cards are similiar to last year, but offer some variations, jumbo multi players, and dual signatures. The books have played out imo. The real winners will be collectors that buy single cards. With the amount case breaks, many people are flipping at lower than normal pricing to recoup funds. There are also a TON of one of ones in the product driving the prices down especially plate patches and plate patch autos. New designs, better patches, and better hits, and no Teir 1/2 cases, have me giving NT 4 Stars. Alex � Thanks for the insight Alex (as well as everyone else who has reviewed this product to share with The Cardboard Connection community! We are getting lots of feedback that this is a quality product but rookie card wise has been seriously devalued on the secondary market because of the frequency of similar looking rookie cards and 1 color jersey autos. But for those looking for a potentially very interesting mix of veteran and HOF’s it looks to be a great premium product – just don’t look at it as an investment type product if buying boxes as the way they have gone about adding rookie cards has made them far less valuable for rookie card collectors than in past years. 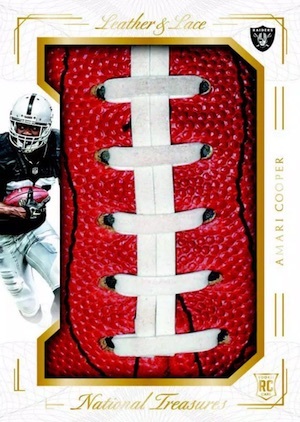 Also be wary of certain other sites that have written “reviews” of this product as Panini had a very expensive promotional event surrounding the release in which they invited the “good ole boy’s club” to generate some over the top buzz that has led to some overly hyped commentary on the product. I recommend that collectors take heed of actual collector reviews like this and several of the other user reviews on this page. If you are still on the fence, check out our forum and other top forums like Blowout’s to cut through the hype and find out exactly what the end consumer has to say about this product. With all that said, those looking to break a box of a high end football product and whose expectations aren’t unreasonably high should have a blast breaking a box. Just do so knowing that this is a very high risk / high reward product and don’t do it expecting to turn a profit on the break. But it is sure to be a fun one and with all the high end inserts, you can easily luck out and pull some very high dollar cards. Did a single box of this, while I believe I did pretty good, I got 3 rpa’s which only 1 had more than a 1 color patch. Got a plate rpa and it even had a 1 color patch. Top card was an auto and the auto smeared on the top of the box (ink is on the top of box). Don’t understand the super bowl autographs and why they aren’t numbered. Got an Edgerrin James and he hasn’t had an on card auto since 2001 or an auto in a product since 2006, too bad I don’t know the print run. Bought into a random team case break with Layton Sports Cards for 65.00. Got the Titans in the break and hit a 7/10 3 color RPA Marcus Mariota, a 4/6 Hats off auto Dorial Green-Beckham auto and a friends and foes Mariota de Anthony Thomas quad patch. Great bang for the buck!!!! I have opened for my collection personally four (4) cases; I am just a collector, not a store or some massive reseller. The product is disappointing at nearly $2k per case. 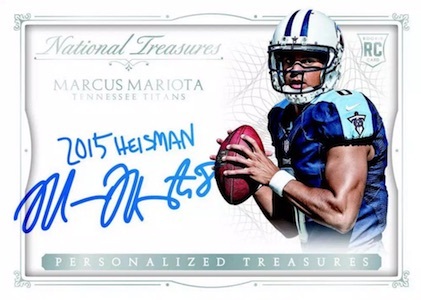 I saw not one single Mariota, Winston, Cooper nor Gurley auto nor RPA in any of the cases. The hits were “singles” at best, no doubles, triples or home runs here. In 16 boxes, I ended up with 9 redemptions, this is sad! It is supposed to be a flagship release, it comes 4+ months after “mosts” football season is over. For goodness sakes, get the work done, then launch the product. Winston and Cooper are redemptions! Can’t even pull two of the top cards. Annnnddd, like some in this review, I too am still waiting on my ’14 RPA of OBJ. WTH?? I have participated in 3 case breaks and viewed numerous others and overall, the value for money is just not there in this product. The design is very nice and quality is top notch, however these reasons alone do not justify an investment of nearly $500 for a box. I realize one big hit and all is well but this approach is highly speculative and not for the faint of heart. For the average collector they will be getting better returns on their investment by buying NT on the secondary market and once initial excitement following the release subsides. Do yourselves a HUGE favor & avoid this product like the plague. Just opened a $500 box and pulled $100 worth of cards and that’s being very optimistic. Of course no Panini “high end” product would be complete without the standard redemption – thanks yet again Panini. Why sell a high end product with any redemptions especially when the collector can wait for years to have it filled? What other company can get away with such a business model? On a related note , I would highly recommend this very worthwhile site include a section for collectors to review the card companies on several useful metrics (e.g., mix of cards per product, quality of product, customer service, number & quality of redemptions, time to fill redemptions, responsiveness to customer needs/wants and value for money). Overall collectors need a voice as it seems the card companies (notably Panini) takes our loyalty, interest and ongoing business for granted.